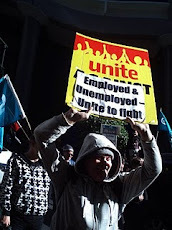 Unite Waitemata Community Branch : 91 Day Benefit Stand Down after 90 Day Employment? 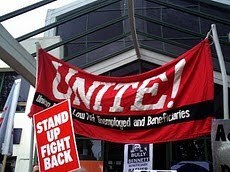 91 Day Benefit Stand Down after 90 Day Employment? 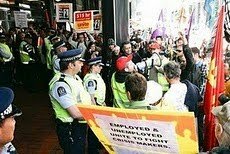 We have been informed that WINZ has stated that it is their policy to give 91 Day Benefit Stand Downs to anyone who lost their job after being employed under a 90 Day Law. This defies all natural justice, since the employer can sack anyone for no reason whatsoever. However from the "Questions for Written Answer" in parliament last October, the Minister for Social Welfare, Paula Bennett, appears to be saying that this policy is wrong. In fact, it has to be proved that the worker who lost their job was guilty of "misconduct." WINZ could possibly be denying thousands of people income that they are legally entitled to and need to survive. 33437 (2010). Catherine Delahunty to the Minister for Social Development and Employment (08 Oct 2010): Have Work and Income staff have been instructed to assess applicants for the unemployment benefit who have lost their jobs under the 90 day law the same way as for any other employment arrangement, including whether or not they should be stood down? 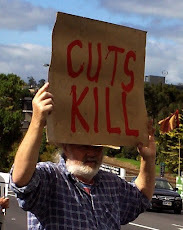 Hon Paula Bennett (Minister for Social Development and Employment) replied: The information requested is available at the Work and Income websitewww.workandincome.govt.nz. This is also my response to written parliamentary questions 33438 and 33439 (2010). 36825 (2010). 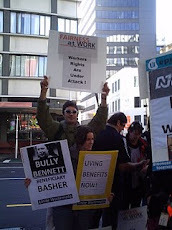 Catherine Delahunty to the Minister for Social Development and Employment (01 Dec 2010): Can she confirm that a correct interpretation of the guidelines published on www.workandincome.govt.nz and referred to in her answer to written question 33437 (2010) is that a Work and Income client subject to a non-entitlement period from a work tested benefit under section 60H of the Social Security Act 1964 because they were fired under the 90 day trial provision and Work and Income Staff deem them to have been fired for reasons of misconduct cannot summons the employer to a Benefits Review Committee hearing. Hon Paula Bennett (Minister for Social Development and Employment) replied: A Benefits Review Committee (BRC) is an administrative body which does not have the powers of a Court to summon witnesses. The Ministry however does have investigative powers and the investigation may include asking questions and seeking information the from an ex-employer. The Benefit Review Committee considers all the relevant information submitted from both parties in reviewing the decision. 36822 (2010). Catherine Delahunty to the Minister for Social Development and Employment (01 Dec 2010): Can she confirm that a correct interpretation of the guidelines published on www.workandincome.govt.nz and referred to in her answer to written question 33437 (2010) is that Work and Income staff assess applicants for a work tested benefit who have lost their jobs under the 90 day trial provision the same way as for any other employment arrangement, including whether or not they receive a non-entitlement period under section 60H of the Social Security Act 1964? 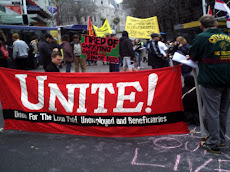 Hon Paula Bennett (Minister for Social Development and Employment) replied: Work and Income staff treat any application for Unemployment Benefit in the same way, whether a client is applying because of a dismissal under the 90 day employment trial or not. A voluntary unemployment stand-down can be considered where there is evidence of misconduct. However, the only difference under the 90 day employment trial, is if an employer alleges misconduct but does not provide proof, and the employee disputes the allegation, then a voluntary unemployment stand-down should not be considered. This reflects the fact that the employee does not have the right to take a personal grievance against the employer or challenge the dismissal in court with some exceptions, where a 90 day employment trial is operating. This is also my response for written parliamentary questions 36823 and 36824 (2010)..